Over 25 Oneota sites are clustered along a 70-km stretch of the Mississippi River between Fort Madison and Muscatine in southeast Iowa. The earliest Oneota sites in southeast Iowa are dated about AD 1300. They appear to have been occupied just after the abandonment of the Moingona cluster of sites. Early Oneota sites in southeast Iowa include Schmeiser, Lost Creek, Kingston, and the Wever Terrace sites. Southeast Iowa Oneota sites are located on bluff tops, terraces, and floodplains and probably represent villages or seasonal habitation sites. The residents grew corn, squash, and beans, and hunted white tailed deer, elk, and bison. Their diet also included fish and other resources from the rich floodplain of the Mississippi River. 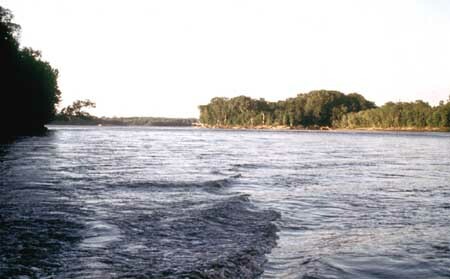 The Kingston site is located on a Mississippi River bluff top, right next to the Malchow Mounds, a Woodland mound group built about 1,000 years before the Oneota lived there. The Kingston site occupies about 2 hectares,. Though damaged by modern plowing, the site contained refuse-filled storage pits and other Oneota material from the early 14th century. The Wever Terrace is a high, loess-covered terrace in the Mississippi River valley at the mouth of the Skunk River in Lee County. Sixteen sites have been identified on the terrace, several of which are Oneota villages. The largest, dated between AD 1300 and 1600, contained 1,300 features, mostly storage pits. Excavations recovered many artifacts, including 4,200 chipped stone tools, 100 corn grinding slabs, and 3,100 rim sherds. Thirty-five human burials were also found at Wever, in small groups and individual graves. Together, the evidence indicates intensive but intermittent occupations. 2000. Iowa's Archaeological Past. The University of Iowa Press, Iowa City. 1995. Oneota Evolution and Interactions: A Perspective form the Wever Terrace, Southeast Iowa. In William Green, ed., Oneota Archaeology, Past Present and Future. Report 20. Office of the State Archaeologist, The University of Iowa, Iowa City. 1998. The Oneota Tradition. In W. Raymond Wood, ed., Archaeology on the Great Plains. University Press of Kansas, Lawrence. 1998. Southeast Iowa Oneota: A Review. Wisconsin Archeologist 79:147-164.